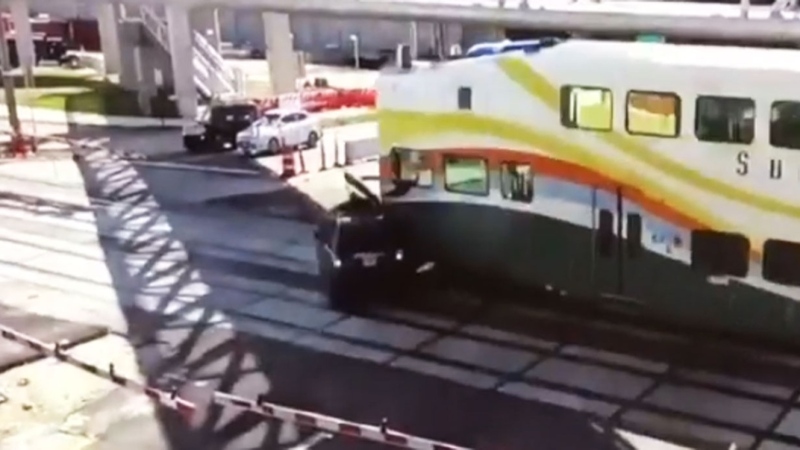 Orlando police have released footage of a bizarre incident where a train plowed into an SUV that had just driven under a closing railway barrier. Security camera footage from April 11 shows the SUV slowly drive forward, just beating the lowering safety arms, before pausing just inside the crossing. Bafflingly, the driver appears to stop and wait, before slowly driving forward directly into the front of the oncoming train. Orlando police released the surveillance footage out the following day as a warning for motorists. Local media reported that the driver was rushed to the hospital in serious condition.